We had a very Happy Christmas here at Ferretworld - although it was busy until the very last minute. The plumber and electricians were here on Wednesday and connected the kitchen and some of the electrics. We also have the washing machine back inside after 4 months on the deck. The dishwasher was a casualty of being stored outside and we have to order a new one, however after washing dishes in a bowl for the last 2 months it's so nice to have a real sink with running water. 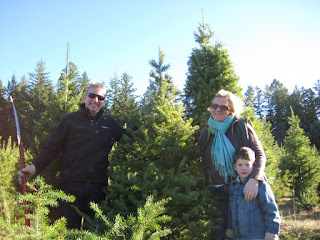 On Christmas Eve afternoon we finally finished cleaning the house up and moving furniture and managed to get out to Castle Rock Christmas Tree farm to get our tree. We installed the tree in our new family room. 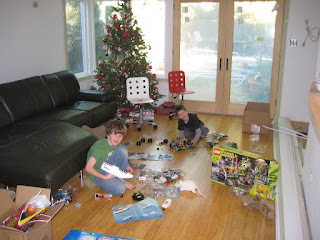 (The electricians activiated one circuit so we could plug in the tree lights and a lamp). 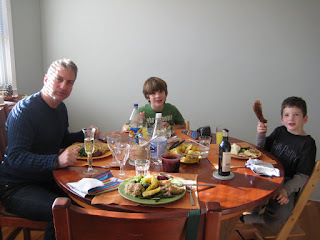 Our first meal in the new kitchen was Christmas dinner - and I'm pleased to report that it worked well. I had ordered a meal from WholeFoods which was good as I discovered that I had only 2 pans, none of our Christmas china, and no serving dishes available. Still - it tasted just as good served from my pyrex baking ware. I hope your Christmas was as happy and comfortable as ours. Well, actually we are not finished by quite some distance - but we are trying to get actually into the kitchen for Christmas day. My backup plan is to barbecue the turkey! 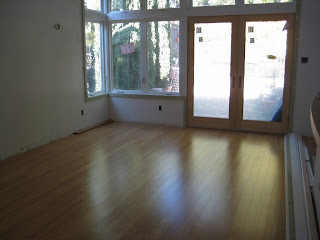 The living and kitchen floor went in this week - the floor is a stranded bamboo by Dansk. It's an engineered flooring material: strips of bamboo glued into a solid plank that is then nailed down. The glue makes the bamboo much more hardwearing as the non-stranded products apparently tend to scratch. It reminds me of the glue beams that were used in the structure of the house. We also got our new sofa which arrived before the floor was completed and had to sit in the garden until there was room to bring it inside! The kitchen counter was installed yesterday - but the kitchen is full of electricians, plumbers, and carpenters so I am keeping out of the way. I have replaced all the handles on the old cabinet doors, and installed them on the new doors - so as soon as everyone leaves I will start filling the cabinets and get the piles of food out of the living room! 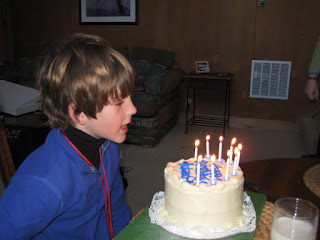 Adam celebrated his 9th birthday in the snow. 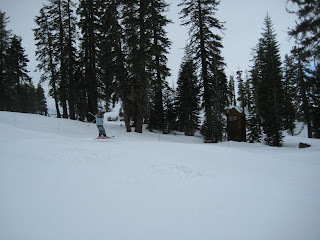 We went to Bear Valley for a couple of days. 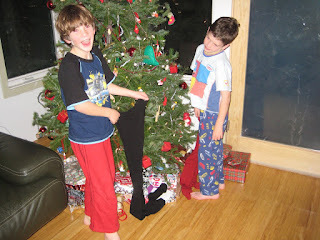 The boys both had lessons and really improved their style. 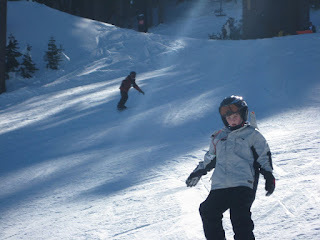 Adam is all about the moves on his board and the boarder talk in the lift line! They both had the confidence to try out some of the (small) jumps: here is Fin catching some air. They are both good enough skiing and boarding to be able to ski with us all over the mountain and since the lines were short we put in some serious hours skiing...I was exhausted - but they still had energy to celebrate with friends in the evening. 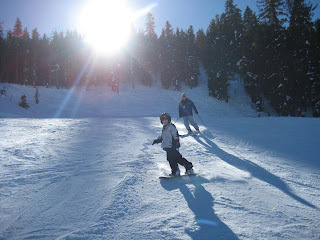 Adam's best friend Henry also took his first boarding lessons and they were able to go out together on the cub slope. Happy birthday to my little dude! Painting: Bedroom, bathroom, and utility room all done. 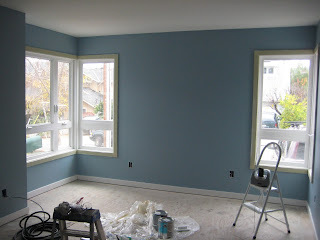 Our bedroom is shown here painted in Benjamin Moore colour Exhale. The wall between the windows is planned to be covered with wallpaper - a brown base with metallic leaves. 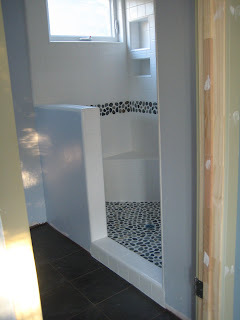 Tiling: The old bathroom has received it's patch which I really like. 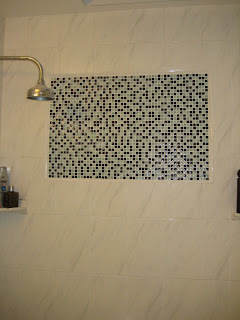 The tile is a glass/marble/black stone mosaic from Home Depot. Now all we need to do is get the contractor to remove the paperwork which is trapped between the screen and window of the new skylight and we might have some natural light in here. 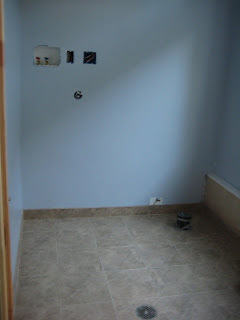 The utility room is also tiled - again some cheap tile from Home Depot in here. Marzetti limestone-effect ceramic tiles with a mocha grout. Thanks to Rocky Hudson of Dynamic Ceramics. Our bathroom tile is also complete - the floor is Panaria Stoneboard in petrol grey, and the stone accent is Island Stone in Java Grey. The matte white tile is from DalTile. 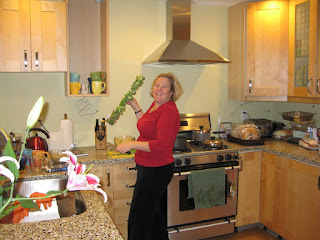 This week: more flooring, kitchen counters, and hopefully kitchen appliances - please keep fingers crossed that we are not having barbecue for Christmas dinner! 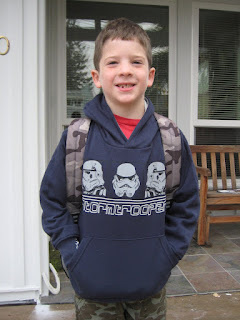 Last week Fin celebrated his 7th birthday - he bounded into our room at 6:45 shouting "I'm seven, I'm seven"! 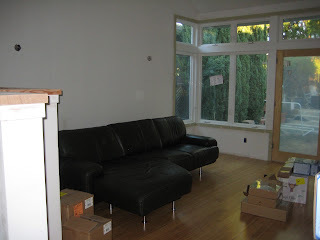 Celebrations took place in our building-site of a living room - but enthusiasm was undimmed. 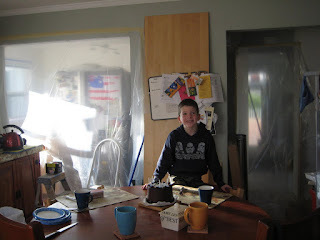 The drywall texture was being applied and it was very dusty so we curtained off all doorways with plastic. The fridge looks rather ghostly behind it's plastic sheet. 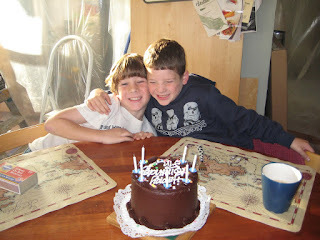 He chose chocolate cake with chocolate filling and chocolate frosting... it was very chocolaty. Things are moving really fast on the house now - we actually have doors! The door and window trim is being installed which is really giving the house a finished look. Nigel and I have also decided to do some painting to save some money (we are at that point in the project when the money is running out faster than the project!). Last weekend we primed and painted our dining room (Restoration Hardware Silver Sage - the colour it was previously) and new kitchen (Benjamin Moore Mellowed Ivory - interesting since it's actually green not ivory at all). I also assmbled the new IKEA cabinets. 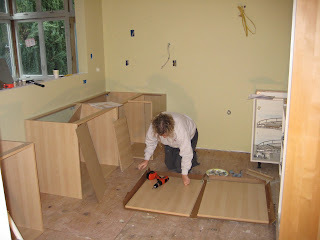 The kitchen was ready for the cabinets to be installed on Monday so the counter top installation people could come on Tuesday and make a template. It's odd to be choosing colours rather than talking about structure. 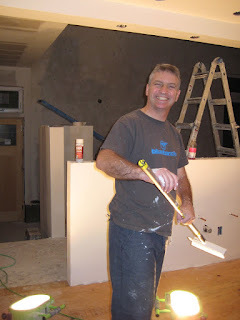 When we bought this house 10 years ago we did all the painting in an empty house, we were quite nostalgic to be doing it again although 10 years ago we didn't have to stop to look after any children! I'm knitting the Heather Hoodie Vest from Knitscene Fall 2009. It's not a magazine that I usually read, but I saw this vest on Ravelry and thought it would be perfect both for my wardrobe and to use some stash wool. 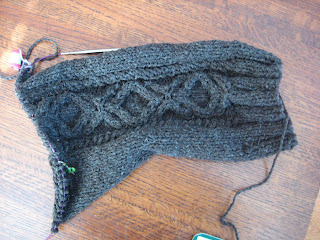 I'm knitting this in Targee Aran weight from Sweet Grass Wool, that I bought at Stitches earlier this year. The Targee feels like a handspun and smells pleasantly and slightly sheepy. It has great stitch definition in the cables. The actual knitting was really quick (hooray for aran wool on 4mm needles) but I now need to press the edges to pick up the ribbed edges for the sleeves and button band. Of course what I don't currently have is anywhere to press or block this sweater so it will need to wait until the house is further along in it's construction. 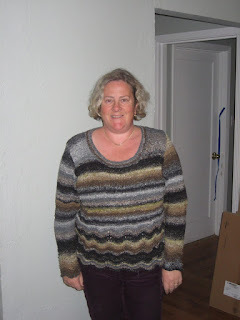 I finished my Noro Chirimen sweater and have already worn it several times. The addition of silk to the cotton gives the sweater a nice drape, and also some warmth. The pattern is a Jenny Watson design from the Noro Flowers book. Lovely book with a lot of things that I would like to knit - but amazingly there are apparently only 2 people (including me) knitting this pattern on Ravelry. 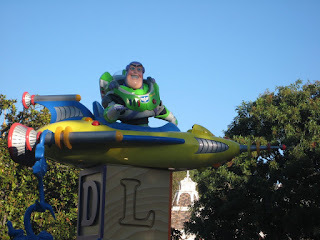 We made our now-becoming- traditional Thanksgiving trip to Disneyland this year. 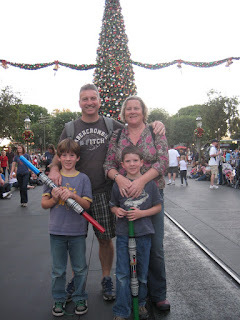 We spent one day in the park - but as the boys are becoming older it was a longer day this year. As usual the crowds were light early on (8am when the park opened), getting busier through the day. By lunchtime we had been on all the rides we wanted, including, at Adam's request a mother-son ride on Splash Mountain which resulted in my getting soaked to the skin. However the 85 degree temperature helped dry me out. Of course Disney is in full Christmas mode and we got to see Santa and his herd of sweating reindeer. 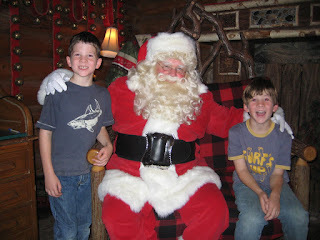 The boys got a chance to meet Santa and explain their comprehensive lists of things that they want. 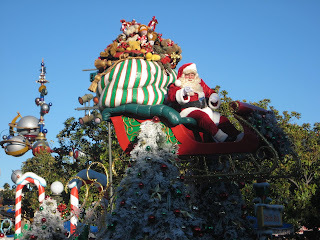 We attended the parade of course - I love the juxtaposition of fake snow and sleighs against the beautiful blue of a SoCal November sky! Happy Thanksgiving to all who celebrate. 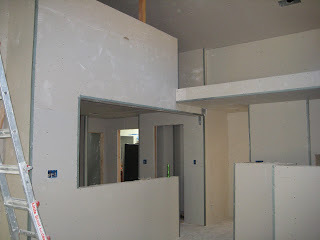 Work on the house is progressing - this week has seen the drywall go on as well as most of the taping and texture. It's really starting to seem like a real house and is snug and warm inside now which helps as the temperature here is starting to drop. This photo shows looking into the kitchen, the half wall around the loft is now covered, with the balcony waiting for railings.